Minas Tirith, who in 1989 stole their name from Tolkiens poetic parallels to the conflicts and irrationalities of this world. The tale of Minas Tirith, of Norway, all began on a small and peaceful village, not too far away from the place they call Oslo. Mayhem came to town. In their luggage they carried Red Harvest and Death Mission, as support acts. They needed a local band too, and the newly born Minas Tirith was chosen. Minas` first gig did not impress as much as the following acts of the night, though. They were too young . The trio was still cheered by a few special friends, who, sadly, are dead now. Their journey went on, however. Two demos, "Tower of doom" and "While I hold the Devil`s hand", were recorded and released in the early nineties. Financed through minimal means, like all their releases. Inspired by the trash/doom metal of the eighties and the American death metal of the era they still developed a different sound, seeking to unite their various influences into one band. Three very different personalities became one beast that would roar, but also be smooth and soft. Among norwegian bands, early Red Harvest was an influence through their superior musicianship as a band. 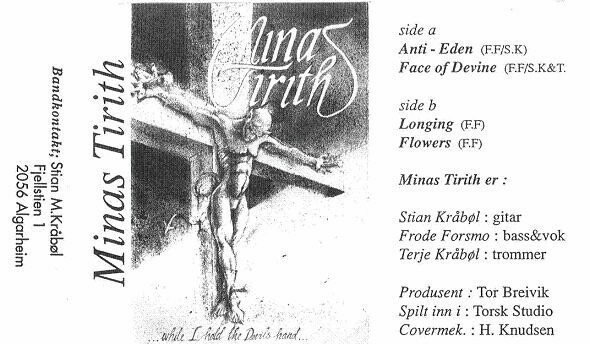 Early Darkthrone, before they changed direction, was also an influence. The wave of norwegian black metal came, and Minas Tirith simply did not jump on this wagon, even though they knew that this would reduce their chances of reaching a larger audience. They just continued to develop their signature sound, and their, slightly bizzare, lyrical philosophy, seeking the true magic that is found on far darker places than in the spotlight. They released two records on own label. 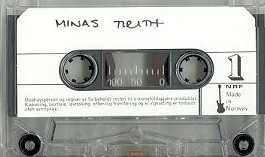 The EP "Mythology" in 93, and the rather progressive The art of becoming" in 96.